The Elves were the first Outside Kindred to come to Trollworld. Legends say they came here in flight from the depradations of the Dragons. Certainly there is an ancient enmity between the two races of beings. Elves are secretive and keep to themselves–not much is really known about them. One thing that is generally not known is that there are many different kinds of Elves. In Khazan we tend to think of the Forest Elves when we say the word, but there are also Cave Elves, Jungle Elves, Sea-Elves, Desert Elves. Even among the Forest Elves there are many different tribes and traditions. For a people that claims to be slow to reproduce, the Elves certainly seem to be numerous enough, and found everywhere on Trollworld. They are concealing some great secret–that is certain. The Elfin race is manlike in form, but taller and thinner than Humans in general. At least that is true of the High Elves. Low Elves like Fairies and Leprechauns have diminished stature. (Fairies and Leprechauns claim that they are not Elves at all, but they first appeared on Trollworld at the same time as the Elves and apparently came with them.) Their forms are symmetrical, and they seem to glow with an inner light, such that all who see them are impressed with their beauty. Elves are generally slimmer and taller than Humans. They have slightly slanted eyes, small noses, and ears that come to distinct point on top with very little earlobe at the bottom. A peculiarity of true Elves is that certain parts of their bodies never stop growing, including their noses, ears, fingers, and toes. The growth of these body parts slows as time goes on, but never stops entirely. Truly ancient Elves more than a thousand years old may be recognized by the extreme size of their ears and noses. The ancient ones often cloak themselves in illusion to maintain the appearance of youth and beauty when they are really old and grotesque. All Elfin races have little body hair, but what they do have tends to be long and beautiful and extremely strong. Magical ropes braided from Elf hair are said to be unbreakable. Their skin tones range from deepest ebony to palest albino white. Dark elves sometimes have a cyanotic blue tinge to their complexions while Light elves may take on greenish or brownish tints. Elves are inherently magical and most know a few spells, though only a few train exclusively as Wizards. Wizardy becomes more interesting to them as they grow olderand come to crave the power that magic brings. Magic comes naturally to them, and they take it for granted, but a tradition of doing things the hard way–the nonmagical way–seems to have grown up among them. There is an Elven saying that there is no Honor in Magic. The Forest Elves of whom we speak are divided into several different Tribes and Traditions, each of which has its own language–a few of the better known ones being Quendir, Shynya, and Alvenarr. Most Elves have also learned the Common Speech as it holds terms and concepts that cannot be explained in Elven tongues (like dolt and stupid). Although languages like Quendir and Shynya are considered to be different tongues, they contain many words that are common to both, and to the non-Elven ear they all sound pretty much the same. The word “Aelvv” in most Elven dialects means “Fallen” or “Ruined”. It refers to their own name for themselves as “fallen spirits” seduced by the beauty of matter, and expelled from heaven. According to Elven story, they are the first-born of all intelligent races, expelled from the Realm of the Gods at the beginning of time by their own choice to live in the world that had been newly created. What world is not certain, for the Elves did not originate on Trollworld, and they know it. The earliest Elven legends speak of great migrations of Elven peoples, including the Fairies, the Leprechauns, the Pookas, and several other lesser known sprites coming to Trollworld through a magical gateway opened by their greatest wizards. They fled a dying world dominated by Dragons, and they came not once but several times as one citadel after another fell to the draconic forces of their foes. Unfortunately, some Dragons also made the transition from world to world, and so the ancient war between Elves and Dragons still continues. There are two major divisions (and hundreds, perhaps thousands of minor divisions) of Elven peoples–the Light Elves and the Dark Elves. The Light Elves are best known–they live in the great Forests and Jungles and Deserts of Trollworld. Some of them have even become seafarers and live out on the open ocean. Their younger sons and daughters often adventure among Men. The Light Elves generally have fairer skin tones, ranging from albino white to a grassy green. On the contrary, the Dark Elves live in underground realms and pocket universes of their own creation. Their skin tones range from deepest ebony through many shades of gray and even a cobalt blue. Direct sunlight is painful to them, and and they avoid it. When they go abroad by day they are heavily robed, hooded, and often masked in order to protect themselves from the light. The Dark Elves are even more secretive and unfriendly than the Light Elves. What little we know of them comes from the Dwarves who sometimes encounter them underground. A Kindred as ancient as the Elves might be expected to have a very high technology, but they seem to prefer a primitive life style. Elves avoid machines and metals whenever they can. All forms of iron poison them. They do use the three elven metals–silver, gold, and mithril, but they use them primarily for making weapons. Forest elves do not mine, but Dark Elves do, and there is a thriving trade between the two branches of the Elven race. Food and wood goes underground–metal and jewels go to the surface world. Forest Elves are savants of plant life. They build their homes among the largest trees in the deepest forests. They know the names and uses of countless herbs. They are masters of both healing and of poisoning using only the plants that grow around them. Some elven teas are said to have miraculous potencies, but it seems that only a few fortunate adventurers and elf friends ever get to taste them. Truly, their very blood is green. Elves love music, drama, and storytelling. They keep their history, both of the People and of individuals, as an oral tradition. They have powerful minds and memories, and it said that an elf never forgets. (Or was that an elephant? Are Elves related to elephants in some way? Hmmm!) Although the Elves do have written forms for their languages, they seem to be used more as a message-carrying medium than anything else. Certainly, no books of Elven history have ever been found, not even during the War of Liberation when many Elven cities were conquered and taken by the forces of the Death Goddess. For a people that claims to love Peace and Beauty, Elves can be incredibly savage. The main profession among Elves is hunter. They do not domesticate animals for food, although they will keep them as pets and servants. Forest Elves often hunt in company with wolves or big cats. Elven hunters live by a strict code. They will not slay a pregnant female or an immature creature. They have a preference for reptile meat–and will go out of their way to hunt down lizards, turtles, crocodilians, and serpents, but they will also hunt birds, mammals, and even insects, especially those of unusual size. The women keep songbirds to brighten up their tree-dwellings, but the men keep hawks and raptors of all sizes. Meat is the favorite food of Elves. Elven children may be rare, but Elven hybrids are not uncommon. Due to their magical natures, Elves can apparently breed with almost anything. Human-elf crossbreeds are called Half-Elves, and the Elven nature seems to predominate. Oddly enough Half-Elves do not share the Elven weakness to iron. They also do not live forever, like their Elfin parent, although they do live twice as long as normal Humans. Elf-Dwarf hybrids are called Dwelfs, and they generally take after the Dwarven parent, but with certain Elfin characteristics like pointed ears, scant face and body hair, unusual skin tones. Dwelfs also share immunity to iron, and seem to love having iron tools and weapons. They are not permitted to live in Elfin communities. Dwelfs often claim that their father was a Dark Elf, and that would seem to be a logical origin for them. Even Trolls–flesh trolls, not rock trolls–have mated with Elves. 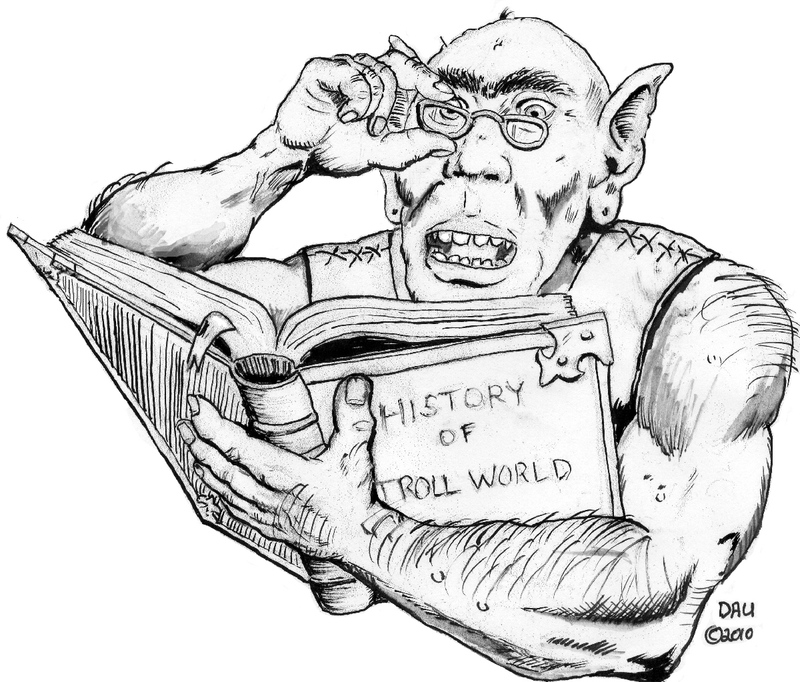 Those hybrids that seem to favor the Troll parent are called Trolfs, while those that favor the Elf parent are known as Trelfs. Both types have high aptitude for magic and an innate savagery that pure Elves can only admire. Troll-Elf hybrids do not regenerate like Trolls and do not attain the extreme size of old Trolls. Perhaps the most famous Halfj-Elf of Trollworld is Lerotra’hh, daughter of the Uruk shaman Rotra and the Elfin princess La-fhrinja-La. Elves have three great weaknesses that prevent them from becoming the dominant race on Trollworld. (1) They breed and grow very slowly. This is partly because Elven women are rare–males outnumber them ten to one, and partly because it takes a very long time for an Elf child to form in the womb–approximately ten years from impregnation to birth. However, since Elves seem to live forever, or at least for a very, very long time, one Elven woman could birth scores, or possibly hundreds of Elven children, and thus they proliferate. Elven halfbreeds, however, normally gestate for the same length of time as the mother would normally take within her own kindred. Once born, it generally takes 50 to 100 years for a child to reach maturity. (2) Cold iron (and all forms of steel) are a deadly poison to Elves. The mere scent of iron can make an Elf nauseous, and the touch of it burns and scalds. Those true Elves who adventure among Men often have extremely high iron resistance, or an amulet of some sort that enables them to endure close proximity to the metal. Many so-called Elves are really Half-Elves who pass for Elves among peoples who don’t know any better. (3) A form of racial melancholy that can sink them into extended periods of deep sorrow and listlessness. This ailment, known as The Wifflygrumbles, can cause an Elf to withdraw for a hundred years at a time. Most of the intelligent kindreds on Trollworld seem to instinctively hate and fear Elves. Something about them–their aloofness, their intolerance of others, their natural sense of superiority, their immortality, and even their beauty, alienate other peoples. No being likes to feel inferior, and Elves have a way of making all non-Elves feel very inferior indeed. Only Humans seem to get along well with Elves, and that may be because they are the Kindred that is most like them in many ways. Elves tolerate Humans much better than they do any other Kindred. A drunken Elf was once heard to say that Humans are the most entertaining pets on the planet. That started a fight, of course. We can only wish that the humans in the tavern with him hadn’t been so combative and had pumped that inebriated Elf for more information on the topic. Art in this blog by David Ullery and Chad Thorson. My thanks to both artists for permission to use their work. Ever notice how it’s usually the male Elf-Trolls that most resemble the Troll parent and it’s usually the female Elf-Trolls that most resemble the Elf parent?